To recognize a Realtor love for his or her territory and genuine interest in fulfilling the wants, needs and goals of clients is to find a true ally when it comes to the purchase or sale of one’s home. Latrese Hargrave meets and exceeds those criteria. A life long resident of Jacksonville FL, she offers in-depth knowledge of the local real estate market, as well as of the area’s schools, services, cultural and recreational activities. 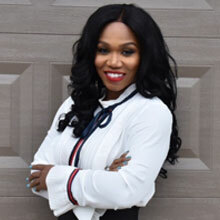 In addition, her enthusiasm for helping people find or sell their homes abounds whether the transaction is for $100 thousand or $100million. Latrese is dedicated to her clients best interests. Latrese's clients and colleagues alike appreciate her honesty, integrity, organizational skills, and ability to negotiate win-win transactions. She is known as well for her intuition and compassion, which translate into her natural ability to put clients first, and to a dedication to giving back to her community. She spent over five years as a volunteer with the Feed the Hungry program at her local church and is involved with various charity drives.